The Houston Rockets selected center Yao Ming with the top overall pick in the 2002 NBA Draft. The 7’6 Yao came to the NBA after spending five years playing professionally in China. Yao averaged 13.5 points and 8.2 rebounds en route to finishing second in Rookie of the Year voting for the 2002-03 season. Yao was also named to the league’s All-Rookie First Team. Yao spent his entire NBA career with the Rockets, but appeared in only five games over his final two seasons due to injuries. With the second overall pick in the 2002 NBA Draft, the Chicago Bulls selected Duke guard Jay Williams. Duke teammate and forward Mike Dunleavy Jr. went third overall to the Golden State Warriors. At number four, the Memphis Grizzlies took Kansas forward Drew Gooden. The Denver Nuggets rounded out the top five with the selection of Nikoloz Tskitishvili. 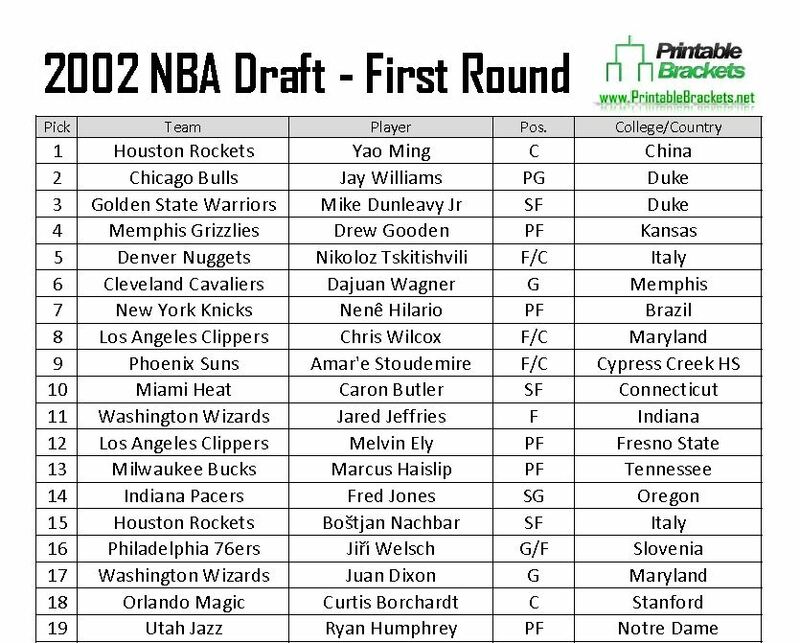 Other notable players selected in the first round of the 2002 NBA Draft include Jared Jeffries, Juan Dixon, Kareem Rush, Nenad Krstic, John Salmons and Tayshaun Prince. The second round arguably produced as much overall talent, as Carlos Boozer, Matt Barnes, Rasual Butler and Luis Scola all went after round one in the 2002 NBA Draft. Stoudemire edged out Yao to win Rookie of the Year honors. Stoudemire, Yao, Butler, Gooden and Nene were all named to the All-Rookie First Team. Notable players who went unselected in the 2002 NBA Draft include Reggie Evans, Udonis Haslem and Smush Parker.